Constructed of heavy-duty, high-impact polystyrene, Homax Drywall Knife is both durable and lightweight. It?s an easy to use and comfortable drywall tool to hold in your hand. Perfect for new or patch and repair drywall jobs. For DIYers or pro contractors. Use for spreading and scraping muds, pastes and more. Constructed of heavy-duty, high-impact polystyrene, Homax Drywall Knife is both durable and lightweight. It?s an easy to use and comfortable drywall tool to hold in your hand. Perfect for new or patch and repair drywall jobs. For DIYers or pro contractors. Use for spreading and scraping muds, pastes and more. Homax Drywall Corner Tool has beveled straight edges and molded 90-degree angle to aid in applying joint compound, taping or repairs of inside corners. Constructed of heavy-duty, high-impact polystyrene. Durable and lightweight. Great for do-it-yourselfers and pro contractors. 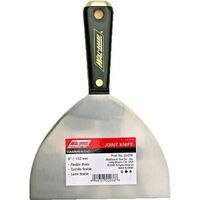 Wallboard Taping Knife, High Impact, 8 in Blade Width, Polystyrene Plastic Blade, Flexible Blade, Reinforced Handle Marshalltown Corner Tool, Plastic Blade, 90 deg Lightweight surface preparation tool designed for high performance with a small investment. Handle is reinforced to outlast other disposable tools. One piece polypropylene construction. Homax Triple Edge Drywall Knife is a 3-blade drywall knife, wall paper smoother and paint shield all-in-one! Constructed of heavy-duty, high-impact polystyrene, this 3-in-1 drywall knife is flexible and lightweight. 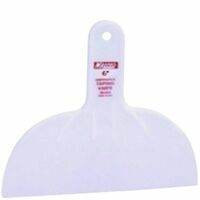 Offers a 10" side, 3.5" side and 80- degree edge for corners. Wallboard Taping Knife, High Impact, 10 in Blade Width, Polystyrene Plastic Blade, Flexible Blade, Reinforced Handle Plastic injection handle with half tang blade construction. Heat treated, sand polished and chrome plated high carbon steel blade. Designed especially for plasterboard. Make cut-outs for electric outlets, etc. Self-starting point-sharpened for plunge cuts. Blade epoxy-bonded and ferruled to stained wood handle for a longer hold. Plastic injection handle with half tang blade construction. Heat treated, sand polished and chrome plated high carbon steel blade. Stamped carbon steel blade, hardened for durability; ergonomic shape for comfortable grip. 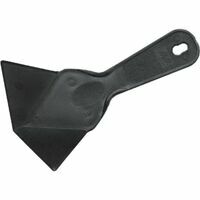 Homax 10" Drywall Mud Tray is perfect for use in mixing and holding mud or other joint compounds. Heavy-duty, high-impact polystyrene. Durable, lightweight and easy to use. The economical choice for any drywall project. Rigid (1.2mm) blade. Bi-Ground teeth. Hardwood handle. Blade Thickness 1.2mm. Stamped carbon steel blade, hardened for durability; ergonomic shape for comfortable grip.